A new study finds more education, outreach needed to prevent anglers from eating fish caught in the Anacostia River. 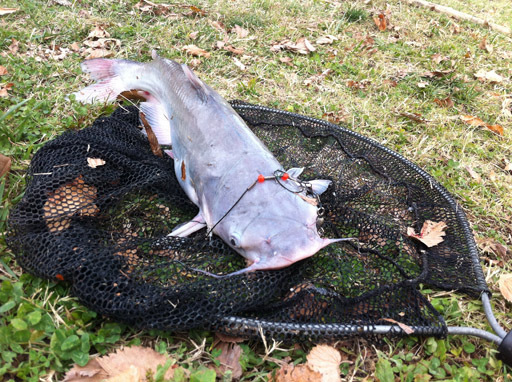 WASHINGTON – The catfish on the end of the line is sleek and fat and fighting hard as a man who identifies himself only as “Joe” pulls it out of the Anacostia River. As the fish flops in the grass, Joe bends down and talks to it. “Come on now, you’re only making it harder,” he says as he takes a hook cutter from his pocket and frees the catfish. As he drops the struggling fish back into the murky water of the Anacostia, he explains to a WTOP reporter that he doesn’t eat the fish he catches. But that, says Mike Bolinder with Anacostia Riverkeeper, is a potentially dangerous belief. “The fish that live in this river — the catfish, the carp and the eel — are rooting around in the sediment that’s on the bottom of the river and that sediment is loaded with toxic chemicals,” Bolinder says. And Maryland’s Department of the Environment suggests that women and children should avoid eating catfish from the Anacostia altogether. Among the contaminants in area waterways, including the Anacostia River, is raw sewage that mixes with storm water runoff during during moderate to heavy rain storms. Also polluting the river are PCBs (polychlorinated biphenyls) used in transformers at the old Pepco plant on Benning Road and PAHs (polycyclic armomatic hydrocarbons), produced when fuels are burned. A visual inspection of the fish doesn’t give any indication of the potential health threats that eating a fish from these waters can pose, Bolinder says. The pollutants in the river accumulate in the tissue of the fish. Many anglers believe that if you don’t see a tumor, there’s no problem. And Bolinder says others believe that if cooked properly, the fish can be made safe. “It is essentially impossible to get a fish hot enough to burn off PCB or PAH,” says Bolinder. Soaking the fish in vinegar or milk before cooking, another commonly practiced precaution, won’t work either, he says. A recent study, managed by AnacostiaRiverkeeper and authored by Opinionworks, highlights the need to reach out to anglers and make them aware of the potential health hazards. While signs posted in Maryland and D.C. warn of potential health hazards, anglers often don’t take notice of them. Or they can’t read the signs as many don’t speak English as their first language. Postings in the District of Columbia mention “consumption advisories,” and state that anglers should consult the advisory printed in their fishing license or to check online. But many of those who regularly fish along the Anacostia River don’t have fishing licenses, so they wouldn’t learn of the warnings that way, according to the study. Despite the risks and warnings, an estimated 17,000 people regularly eat fish taken from the Anacostia River — some of them unknowingly as anglers often share their catch with friends, according to the study. Sharing is something that anglers do naturally. When Joe caught his catfish, he trimmed off some bait for a young man nearby, advising him on what worked best. Bolinder says he understands the impulse of sharing a catch.